A year-long honeymoon? A temporary retirement trip while our bones and joints can still carry us strong? Call it what you will, we are a 20- (pushing 30-) something couple from Chicago, USA living our dream of exploring the world. While we watched most of our friends idle away their 20′s climbing the corporate ladder, we have spent most of ours traveling the world. Semesters abroad in Europe during our college days ignited an insatiable passion for travel but it was a year-long journey across South America that confirmed this wanderlust was here to stay. 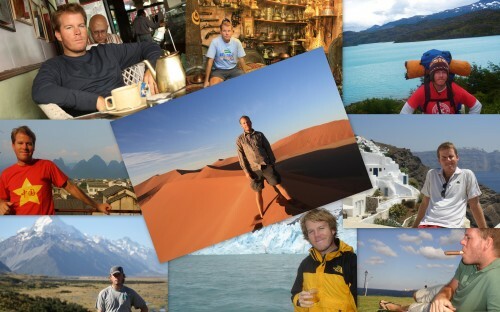 Dedicating three of the last 10 years to traversing the globe, our most recent adventure took us around the world on a 14-month odyssey spanning six continents. Together, we are avid travelers and cultural enthusiasts. Accents and foreign languages intrigue us. Exotic foods delight us. And what others do differently perplexes and amazes us. Individually, we are Ryan and Laura. Ryan: I can best be described in caveman terms. I like to run. I like to eat. And I like to drink. I do consider myself a bit more complex than that, however. I possess none of the Japanese “moderation in all things,” typically assailing the center for the extremes. I’m an avowed urbanite who also enjoys the great outdoors (not a huge fan of the suburban middle) and can indulge at the corner falafel stand as much as at an upscale restaurant. Like Oprah I, too, have some favorite things. This should about sum it up: encased meats, landscape architecture, pork belly, hoppy ales and roasted stouts, “debates,” and people agreeing with me. Oh, and I’m awesome at “making due,” a true culinary MacGyver of resourcefulness in the kitchen. Laura: I’ve been hooked on language since the third grade. I remember a friend of mine taking a Spanish class when we were eight years old. I made her teach me everything she learned. I jumped the first chance I got…a high school trip to Costa Rica. That lead to a seven-month stint during college in Spain and then, there was really no turning back. As soon as I graduated college and saved a bit of cash, I booked a one-way ticket to South America with my partner in crime and life-long travel companion, Ryan. We’d met when I was a brace-faced, frizzy-haired 14-year old. Ten years later we said I do. I’m two parts type A, one part adventurer. I’m a planner at heart, and spontaneity is not in my blood. I followed the straight and narrow path for a life I’d been raised. It never felt right so I ran away to see the world. I’m certainly not content with two weeks of vacation, spending my days sitting in front of a computer, buying a home and mowing the lawn. There is so much more to the world that what I can see from here. I’m off to find it. Travel is many things to many people. To us, it is a necessity. It has shown us who we are, who we’re not and who we want to become. We hope you’ll follow us on our adventures and be inspired to do the same – live the life you have imagined.